Total remodel a year ago, with gorgeous up-to-date decor. You'll love the open living-dining-kitchen area with vaulted ceilings, fireplace and walkout to the deck. the kitchen features stylish new cabinets, big island, granite countertops, subway tile backsplash, and slate-finish appliances. The main level also includes the nice size master bedroom and full bath. The daylight lower level includes two more bedrooms, second full bath, and storage room. Lawn mowing is provided. 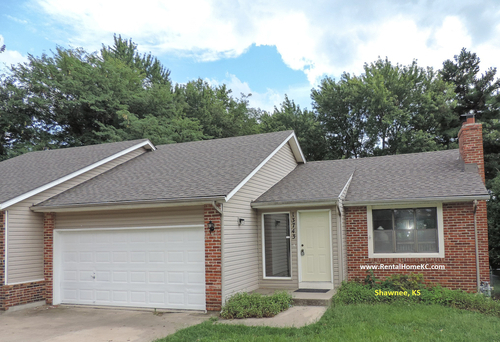 This home is located just northwest of Shawnee Mission Parkway and Pflumm. Easy commute to I-435 or I-35 and lots of retail and dining nearby. Pet Policy Small dog depending on breed and age. No cats.